FN4 — 3i/2" steam inlet. Unit will deliver full power at 440 lbs & 760°TT. OAL 16' 3-3/8"—OAW 6'6"—OAH 7'5i/4"—wt. 36000 lbs. Almost equal to new. Very little use. With ABS or Lloyds. G.E. 600 KW GEARED TURBO GENERATORS 450/3/60/1200 RPM — 961 amps — type ATI — 0.8 PF. TURBINE: FSN-FN-20 6-stage— 525 lbs/8250 F — superheat 355°/371°F. GEAR: 10033/ 1200 — RPM 10033 — total — 6390 lbs. steam/hr. steam flow. SETS FOR BETH-SPARROWS POINT HULLS 4467 TO 5400; QUINCY HULLS 1600 SERIES 400 KW (500 KVA) — 0.8 PF — 1200 RPM — 450/3/60. TURBINE: 585 lbs — 840°TT — 28V2" vacuum'—9018 RPM — serial 10A4462-3 & 10A4462-4. KW—450 volts — 641 amps — 0.8 PF —3-phase 60-cycle — 1200 RPM —CR 40° — excitation amps 41 — excitation voltage 120. Instruction book 5442. Switchgear available. BINE: M-20-EH — 20 lbs dry & saturated — 25" vacuum. 7283 RPM. GEAR: 7283/1800. VDC — 500 amps — SK — stab, shunt wound. RPM. HELICAL GEAR: 9977/1200 RPM. Serial # of turbine 245204 — weight 22,000 lbs. 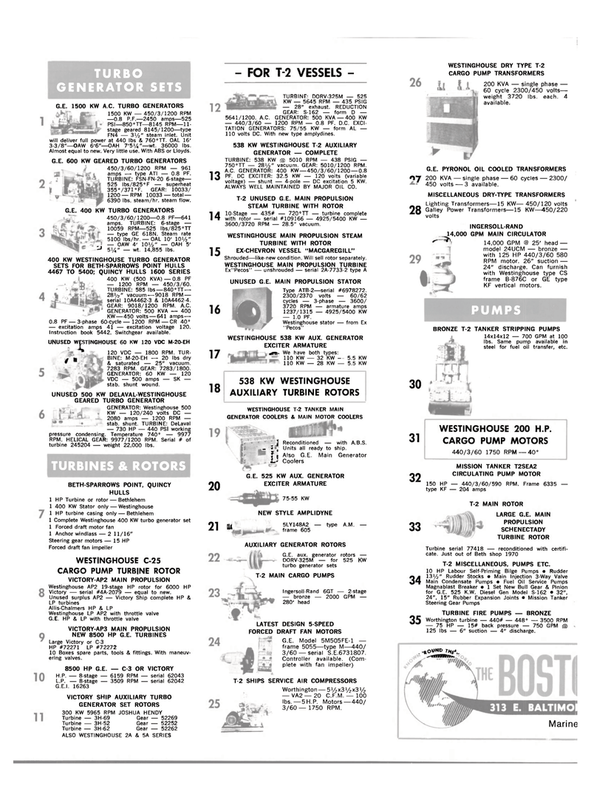 HULLS 1 HP Turbine or rotor—Bethlehem 1 400 KW Stator only — Westinghouse 1 HP turbine casing only—Bethlehem 1 Complete Westinghouse 400 KW turbo generator set 1 Forced draft motor fan 1 Anchor windlass — 2 11/16"
Victory — serial #4A-2079 — equal to new. TURBINE: 538 KW ® 5010 RPM — 438 PSIG — 750°TT — 281/2" vacuum. GEAR: 5010/1200 RPM. PF. DC EXCITER: 32.5 KW — 120 volts (variable voltage) — shunt — 4-pole — DC excitation 5 KW. ALWAYS WELL MAINTAINED BY MAJOR OIL CO. STEAM TURBINE WITH ROTOR 10-Stage — 435# — 720°TT — turbine complete with rotor — serial #109166 — 4925/5400 KW — 3600/3720 RPM — 28.5" vacuum. Shrouded—like-new condition. Will sell rotor separately. Type ATB-2—serial #6978272. 2300/2370 volts — 60/62 cycles — 3-phase — 3600/ 3720 RPM — armature amps 1237/1315 — 4925/5400 KW — 1.0 PF. Westinghouse stator — from Ex "Pecos"
G.E. Model 5M505FE-1 — frame 5055—type M—440/ 3/60 — serial S.E.6731807. Wo rt h i n gto n — 5 V2 x3i/2 x3 V2 — VA2 — 20 C.F.M. — 100 lbs.—5H.P. Motors —440/ 3/60 — 1750 RPM. CARGO PUMP TRANSFORMERS 200 KVA — single phase — 60 cycle 2300/450 volts- weight 3720 lbs. each. 4 available. G.E. PYRONOL OIL COOLED TRANSFORMERS 07 200 KVA — single phase — 60 cycles — 2300/ 450 volts — 3 available. Worthington turbine — 440# — 448° — 3500 RPM — 75 HP — 15# back pressure — 750 GPM ® 125 lbs — 6" suction — 4" discharge. • •«o»W) -^mtMn*.